This quilt brightens up my small bedroom and the quality is great. It's quite big on our bed but that allows me to display more of the contrasting back when the bed is made. Overall I would recommend it. 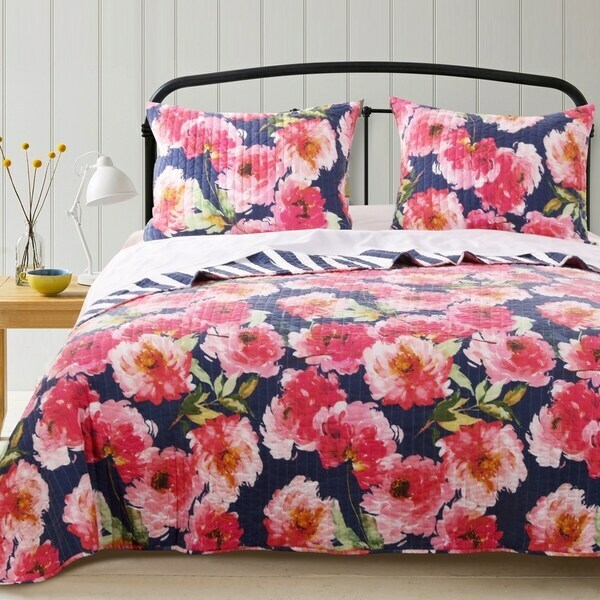 Peony Posy fills your space with big, florid colors and vibrant stripes. Featuring bold brushstrokes of rose, millennial pink, gold and verdant green on navy, this modern quilt set reverses to a painterly stripe in navy and white. Features: • Oversized for better coverage on today's deeper mattresses • Prewashed with extra softener for unparalleled comfort • Machine quilted with fabric bound edges for durability and surface interest • 100% ultra-soft Microfiber polyester face and back; 60% Cotton 40% Polyester cotton-rich fill. • Quilt set comes with quilt and two pillow shams (one sham per Twin set) • Machine Wash • Imported Dimensions: • Twin set includes one (1) 68-inch x 88-inch quilt plus one (1) 20x26" pillow sham • Full/Queen set includes one (1) 90-inch x 90-inch quilt plus two (2) 20-inch x 26-inch pillow shams • King set includes one (1) 105-inch x 95-inch quilt plus two (2) 20-inch x 36-inch pillow shams. • Dimensions +/- 2 inches. Faded after first wash the blue is very blotchy now.